Europe, as a distinct political and economic body as well as a collection of separate states, is facing constitutional challenges from within and without. Brexit, Catalonia, Poland, Hungary and Romania – as well as events within the European Union itself – all present challenges to European principles of constitutionalism. 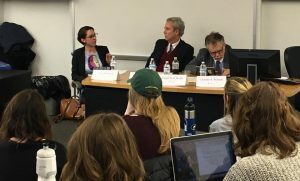 On Thursday, January 25, 2018, the Center for Comparative Legal Studies and Post-Conflict Peacebuilding at William & Mary Law School and the European University Institute sponsored a panel on “Constitutions in the Crosshairs: Europe in 2018” to reflect on Europe’s current challenges and constitutional crossroads. The panel was excellently moderated and organized by Prof. Christie S. Warren, one of the best friends of our working group and featured Prof. Joseph H.H. Weiler, former president of the EUI, Prof. José M. de Areilza, Professor of Law and Jean Monnet Chair, ESADE, Ramón Llull University, Barcelona and Elena Brodeală, EUI researcher and founding member of our working group. 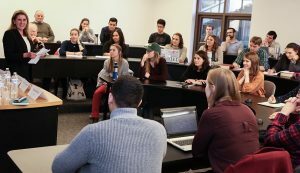 The presentations generated a lively debate on a variety of topics, from referendums and secession processes to populism and rule of law challenges within the EU. Below are some pictures from the event. About William & Mary Law School: Thomas Jefferson founded William & Mary Law School in 1779 to train leaders for the new nation. Now in its third century, America’s oldest law school continues its historic mission of educating citizen lawyers who are prepared both to lead and to serve. Learn more. The Center for Comparative Legal Studies and Post-Conflict Peacebuilding at William & Mary Law School, a partner or our working group, bridges the gap between resources available at academic institutions and the need for them in the field, where people engaged in the difficult work of building democracies, strengthening the rule of law, and reconstructing societies following conflict often labor without basic resources. Learn more.